Hi everyone, we hope your week is off to a good start! Green is certainly in the air this week with all of the St. Patrick’s festivities, but this evening we’re looking at a particular shade of green. The colour in question is of course Khaki, which is being hailed as spring’s coolest and most versatile neutral! Spotted all over the runways from Chanel to Ralph Lauren, the look has successfully been incorporated into the Spring collections of our favourite high street players. There are so many ways to wear Khaki this season. Whether it’s utilitarian cool or safari chic. I personally love how Warehouse have worked it into their ‘Modern Military’ story for Spring. The duster coat above is perfectly feminine, whilst the army jacket below adds a fun urban twist to your every day jeans and stripy top combination. 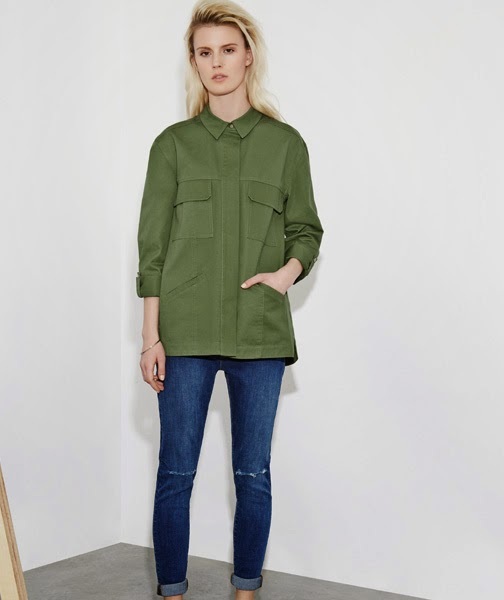 Proving just how versatile this utility jacket is, the buttoned up look below makes for a gorgeous streamlined silhouette, offering a smarter take on the trend. Are you crazy for Khaki? Let us know in the comments below!